This VU meter uses Nixie tubes as the display. There are a total of fourteen IN-13 bar graph tubes that map out the audio spectrum. The build uses purely hardware for the display; no microcontroller processing, or dedicated VU-meter chips were used. Input begins with a dual Op-Amp along with a pair of potentiometers which allow the left and right channels to be balanced. Both channels are then each split into seven signals, which explains the layout of tubes seen above. Each signal is then fed through a voltage divider to envelope the output between 0V and 6V. There is also a low-pass filter to handle sudden volume spikes which don’t work well with the nixies. But as shown in the video after the break, all that work has paid off. Thr clip gives us a look at the green protoboards which host all of this filtering hardware. You’ll want to turn the volume down for the first couple of demonstrations which use a sweep to test the system. Take a gander at the Giant LED bar graph which [Chunky Hampton] recently completed (from this image we don’t think the nick name suits him). It’s simple both mechanically and electrically, but we love the look and think it would be a nice addition to your home, hackerspace, or as a children’s museum exhibit (we’re looking at you [Mr. Porter]). The enclosure is a hunk of PVC electrical conduit. It’s got to be one of the largest sizes, but still should be found at most home stores. The base mounts easily and the cover snaps into place. [Chunky] used a hole saw to create the openings for the LED modules. They’re circular boards with multiple single-color LEDs on them. A common power bus feeds the high side of each bit, while a couple of transistor ICs controlled by 595 shift registers address them on the low side. From there just use any controller you wish, but in this case it’s an Arduino. [Chunky] uses the meter to display power output from his stationary bicycle generator. But he also put together a little Larson Scanner demo which you can see after the break. Ultrasonic rangfinders are a cheap and easy way to gather obstacle avoidance data. 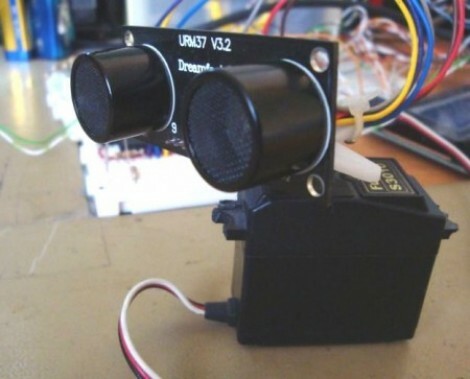 When added to a servo motor they form something of a scanning radar for near-proximity objects. In this implementation, [Rui Cabral] is driving the servo, and collecting data from the sensor using a PIC 18F4520. The servo rotates 180 degreees, taking sensor measurements in increments of nine degrees. If it discovers obstacles, the distance and orientation are recorded. Feedback is displayed on a 20-LED bar graph display which shows a moving LED to track the sensor orientation, with LEDs remaining lit whenever an object is found. Right now the obstacle data is pushed over a serial connection with a PC, but could easily be injected into navigation logic for a robot in order to triangulate a path around the obstruction. You can see [Rui’s] project in action after the break. We looked in on the same concept with a different display technique a couple of years back. That hack used an Arduino and Processing to map sensor data with a traditional green sweep display.